Emotions come in all different varieties: happiness, sadness, anger, hurt, fear, and love. Sometimes you feel only a little happy. Sometimes you feel overjoyed! You can think about how strong an emotion is by coloring in your emotion level on a thermometer. Your Turn Show how strong your emotion is. Draw a thermometer shape (a tall tube with a circle on the bottom). Think of what emotion you are feeling: happiness, sadness, anger, hurt, fear, love, or something else. 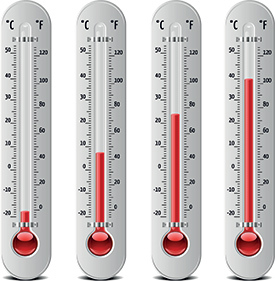 Write the emotion under the thermometer. Think how strongly you are feeling the emotion. If the emotion is not strong, color just the bottom part of the thermometer. If the emotion is really strong, color the whole thermometer. If the emotion is somewhere in between, color from the bottom up to somewhere in between. Are you comfortable feeling this much of this emotion? What could you do to feel more comfortable? Next time you need to express an emotion, you can draw a thermometer to show how strongly you feel it. Checking the Emotion Thermometer by Thoughtful Learning is licensed under a Creative Commons Attribution-NonCommercial-ShareAlike 4.0 International License. Based on a work at k12.thoughtfullearning.com/minilesson/checking-emotion-thermometer.